Photos from Mt. Hood, June 12, 2014 with Portland-based climbing group Mazamas. First clear shot of the day, just as the sun is coming up. We can barely see the Palmer ski lift here, which we followed all the way up from Timberline Lodge after our midnight start. Enjoying a break at sunrise, with the shadow of Mt. Hood visible over the valley. The summit is nearly there, yet we still have at least a couple hours of climbing to ascend the final 700 feet. Walking past Devils Kitchen, on the lower left. This is an active fumarole area that reeks of sulfur. Looking up the Hogsback. 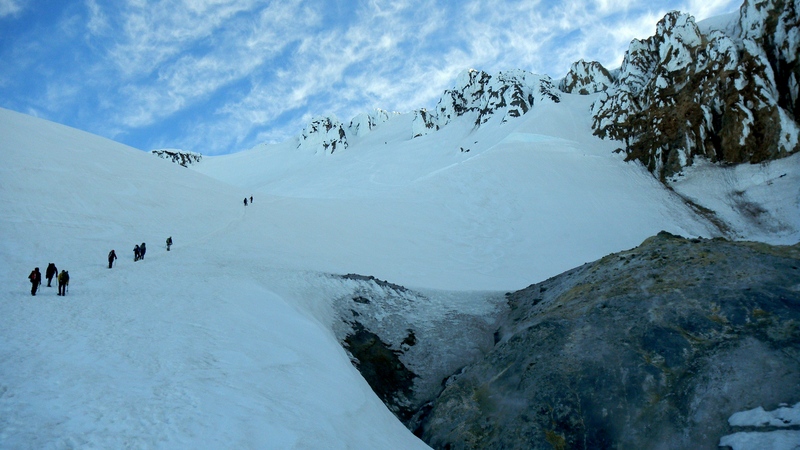 Many climbers rope up on this section, depending on icy conditions. If one person falls off of the steep edge, the person they are roped to must jump off of the other side to balance the weight. Final stretch to the summit over the icy trail. Bundled up at the summit with Mt. St. Helens in the background. Daunting view looking down back at the Hogsback, from the bergshrund. The whole Mazamas crew, at the summit. Pristine weather at Mt. Hood’s summit. Dad and I, celebrating our successful climb. Rappeling down the Old Chute. Descending from the summit, with the Pearly Gates shining over. Halfway down, last view of the summit before we reach the trailhead at Timberline Lodge.